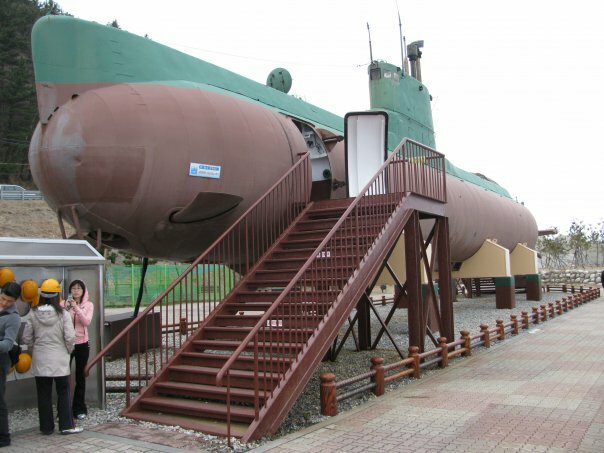 After staring at North Korea for a few minutes at the DMZ and watching tons of videos about North Koreans and their spies, I wanted to see the DPRK spy sub that was captured in 1996. 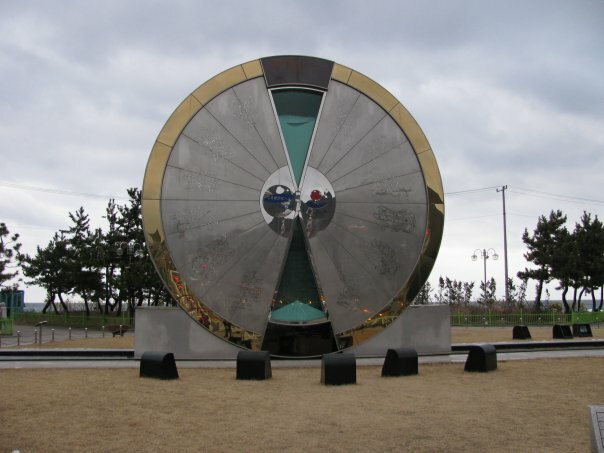 It’s on display at Unification Park in Jeongdongjin on the east coast of Korea (that’s South Korea… the good one). 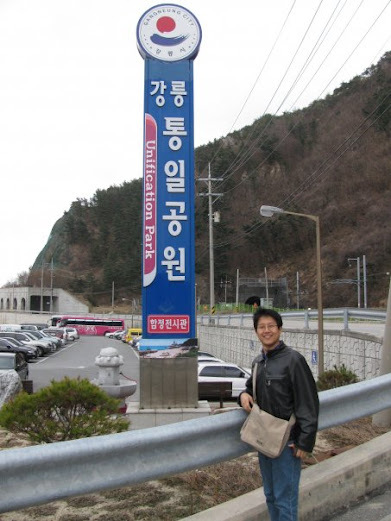 We went to Express Bus Terminal (lines 3, 7, and now 9) at 10:00 am and bought tickets on the next bus out to Gangneung. If you want to make sure that you get the most inexpensive bus tickets available you should check out the bus schedule at the Long Distance Bus website ahead of time and purchase your ticket in advanced. Our tickets cost less than 20,000KRW each. You’ll need a hard hat for this! 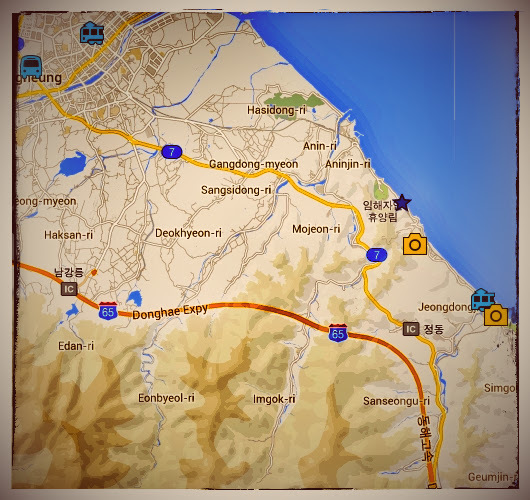 Once we got to Gangneung we were told to take bus #109 or #112 (2,300KRW), but first we needed to take a taxi to bus #112’s bus stop. We should have just taken the taxi all the way to Unification Park since it was very cold. It would have cost 8,000KRW, but we were hungry and thought that we would buy some burgers and eat them while we waited for the bus. We ate our burgers in the freezing cold while the local ajimas (old ladies) gathered round us to gawk at us and talk about us in Korean. It costs 2,000KRW to enter Unification Park in 2009. There are no tour guides, just arrows on the floor and explanations on the walls. There are English translations for most of the information. 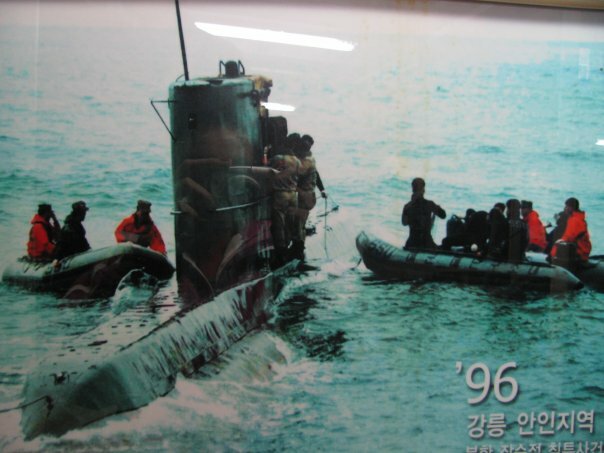 Back in 1996 the DPRK sent some spies to South Korea in a submarine. A few spies left the sub and headed for land. When it was time to go back the spies couldn’t swim out far enough because the sea was rough. They asked that the sub come in further to get them. This was when the submarine got stuck on some rocks that tore it open. At this point going back to the DPRK in their little sub was impossible. They would have to walk back home. 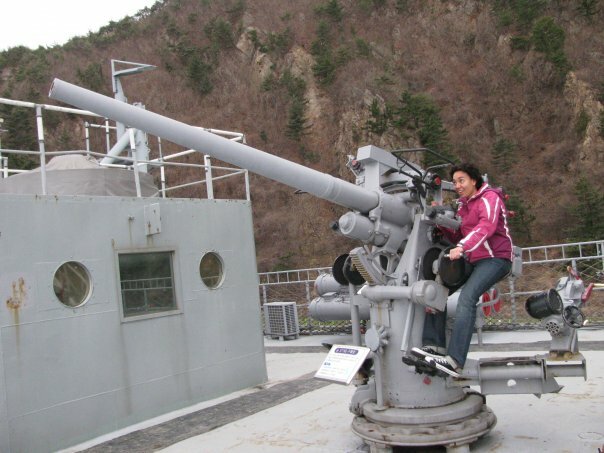 Along with the spying soldiers, there were 11 crew members on board. Before the commander left the sub he shot and killed the crew, so they wouldn’t be tempted to defect, or so we’re told, and got his soldiers on land. A taxi driver passing by saw the sub and called the authorities. 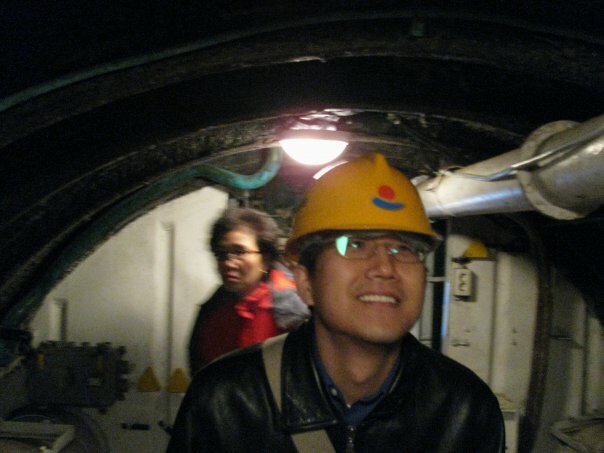 In the end, one man was captured; He lives in Seoul today and he now helps train ROK navy seamen. The rest were killed. This was followed by a formal apology by the DPRK, the assassination of a ROK diplomat in Russia, and an unrelated capture of a U.S. “spy” by North Korea. 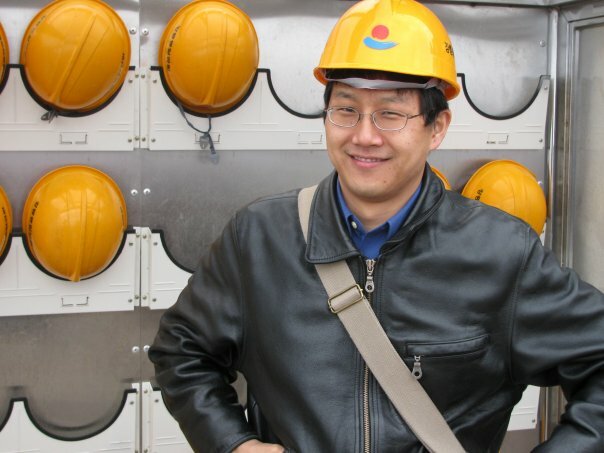 News of the “spy’s” capture was withheld by the DPRK for about two months to divert attention away from both the Gangneun incident and the murder of the diplomat. The “spy”, a guy by the name of Evan Hunziker, later turned out to just be a drunk man with a habit of making really bad life choices. While drinking in China near the Yalu River Hunziker, on a dare, decided to swim over to the banks on the North Korean side. He fell asleep on the North Korean shore and was found the next day by a farmer. Bill Richards, a congressman from New Mexico and later governor, talked the North Korean government down from a ransom of 100,000 USD to a “hotel fee” of 5,000 USD. The Hunziker’s family paid the fee and he was released. The DPRK officials claimed that Hunziker tried to commit suicide while in their custody as a way of explaining the bruises on Hunziker’s body. This seems quite likely since less than a month after his release back in Tacoma, Washington, he shot himself in the head and died. The boat is not as interesting to read about as the sub is, but the ship was more fun to play in. It’s like a playground for adults. Mark and I started to climb on things to take more interesting pictures and in regular human fashion, once people saw us climb on stuff they started to climb on stuff too. In the ship’s gift shop there was a map of the little town we were in. It showed all the cool stuff to do in the area. Most of the cool stuff involved the beach, but it was too cold for swimming. There was also an art park call Haslla. 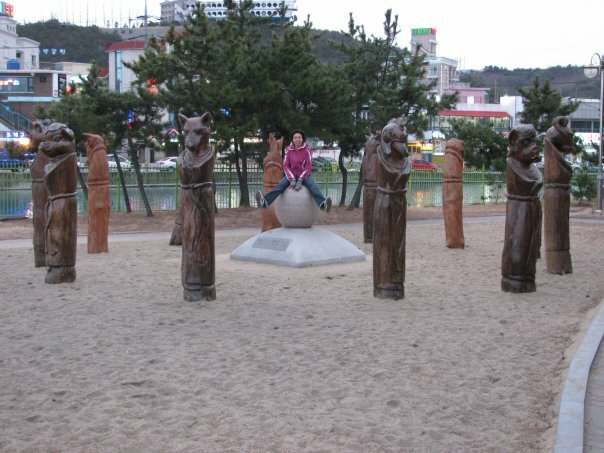 I may not like art museums, but I LOVE Korean park art! We left Unification Park and stood at the bus stop. Since buses pass by at a rate of about 1 bus per hour and it was really cold, we decided to take the first bus, taxi, elephant, or sedan chair that passed by. 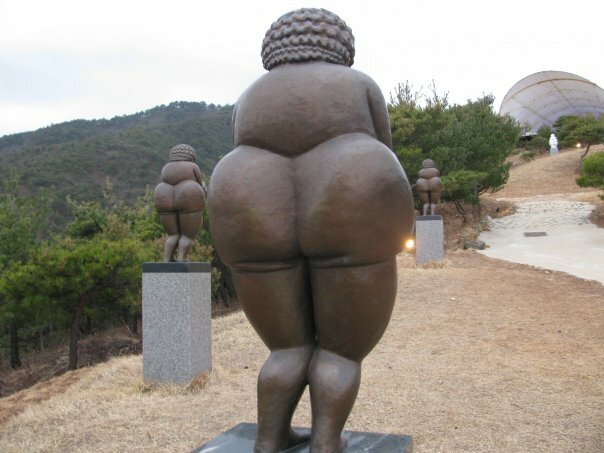 It costs 4,000KRW each to get into the art park the day we went. After wandering around and frolicking amongst various artistic stuff, we wanted to see the huge sandglass downtown. We asked the guard at Haslla to call us a taxi or to at least tell us where to stand to get the bus. He called some guy from the art park and the Haslla shuttle drove us to town free of charge. 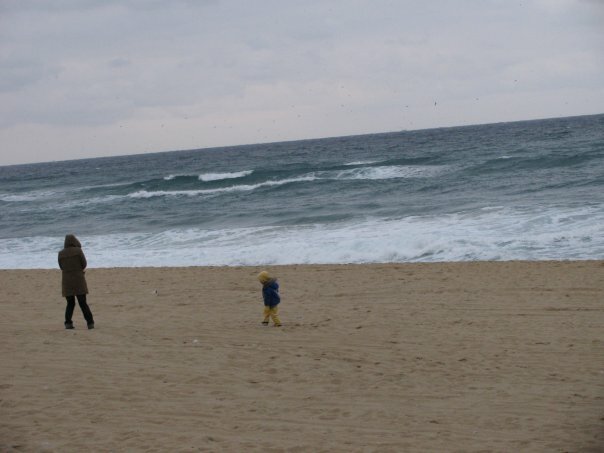 We then saw the one year sandglass and walked near the beach. We ate spicy fish soup at a restaurant by the beach. This is where I ate a fish eyeball for the first time. It was squishy and flavorless, but not terribly gross; just a tiny bit gross. The people at the restaurant spoke no English and we spoke no Korean. I can go into just about any restaurant in Seoul and order food from a Korean restaurant because I know the names of several dishes that I like. But I’m helpless in a restaurant that serves only fish because I barely know the names of fish in English much less in Korean. We did manage to place an order after Mark whipped out his cell phone’s English to Korean translator. 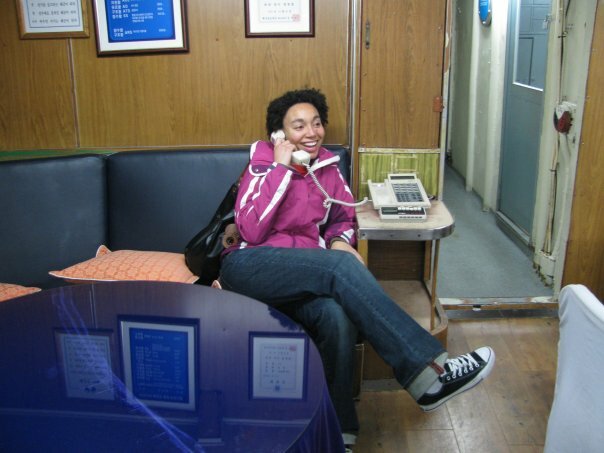 The waitress responded by taking out her cell phone’s Korean to English translator. 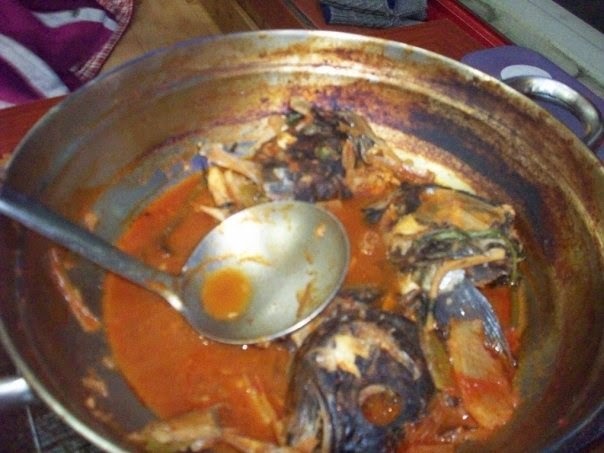 We had a little conversation going that resulted in a big pot of spicy fish soup with many heads. We took the train back to Gangneung, but not before doing some Korean style drinking outside the GS25 (Korean chain of convenience stores). Mark had a beer. I get drunk very easily so I just had some chocolate and iced tea. I know… how can I live with the people if I can’t drink with the people? Have you seen my ship? It’s not easy to get back to Seoul. Once again we didn’t take a taxi and I have no good explanation for that because with 2 people the taxi is cheaper than the train. It just seemed like the most fun option at the time, I guess. We took a bus back to Seoul. This involved missing our first bus, Mark yelling at the poor counter lady, the lady calling Mark a liar, and me saving the day with my mad Korean speaking skills. Okay, it didn’t actually happen that way. We bought our bus tickets back to Seoul on the 9:00 pm bus. We had about 10 minutes to kill. We went downstairs where the buses were parked, figured out where the departing buses parked and where the bus to Seoul should be, saw that the spot was empty, and waited for the bus to show up. We did use the bathroom, played with a blood pressure machine, and complain about how cold it was outside. But every minute we peeked through the glass doors to see if our bus was there. It never showed up; 9:00 pm came and went. No bus. No big deal… we just went up stairs to exchange our tickets for tickets on the next bus. We asked for new tickets, since no bus showed up and the woman started to yell, in Korean, at Mark. Mark yelled back at her, in English. I stood there wondering what the hell was going on. Why so much yelling? There was a lady downstairs we were talking to earlier. She spoke English, so I ran downstairs to get her and ask her if she would help us. By the time I got back upstairs Mark had the new tickets in his hand, but he and the counter lady were still yelling at each other. The English-speaking Korean told us that the ticket clerk said that we were lying and we better not miss the next bus. The 9:30 bus left at 9:25. So if you ever need to catch a long distance bus out in the countryside of Korea, make sure to get there way ahead of schedule. There is no direct way to get the Jeongdongjin from Seoul. 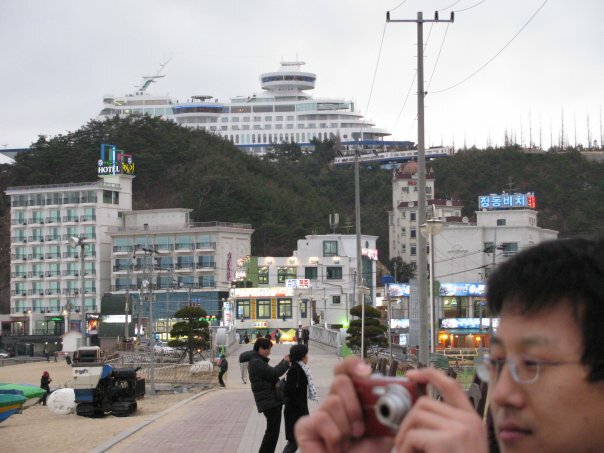 You have to go to Gangneung (강릉) or Donghae (동해) by long distance bus or train then take a local bus or cab to Jeongdongjin. The train to Gangeung takes about 6.5 hours. By bus it only takes 3 hours. This is because there are no train tracks that go from Seoul to Jeongdongjin. You can use your Seoul T-money card on the buses in this town. From Gangeung take bus #111, 112 or 113 (2,300KRW). Go to tourist information to get directions to the bus stop. From Unification Park – There is a bus stop right outside the park. Stand on the south bound side of the road. Stop any bus or taxi heading south and tell the driver to take you to Haslla. I would recommend calling a taxi from Unification Park before hand, if you plan on taking a taxi, since not too many taxis randomly pass by. If you plan on taking a bus, check the bus schedule when you first get to the park. Buses are rare too. From the beach – There is a free shuttle, if you can find it. This is a park of art. From Haslla you might be able to get a ride into town by asking about the free shuttle.